This a wrap checkout counter with slatwall front panel. 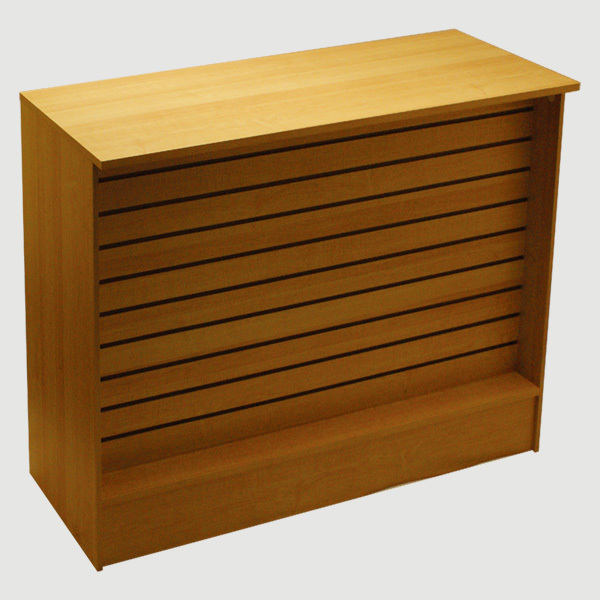 The slatwall front panel allows you to display products in a convenient location for your customers. The solid construction makes this a perfect addition to any high traffic retail space. Available in multiple finishes to fit in your décor. The laminate surface will stand up to whatever environment you place this wrap counter in. On the backside this counter has three adjustable shelves to store important items and keep them close by. This wrap checkout counter will allow you to get the most use and functionality out of your retail space without sacrificing floor space. The simple design of this product means it will blend well with any pre-existing décor.